Published May 6, 2015 By Leisa Good This post may contain affiliate links. Regardless, I only recommend sites I've researched and/or used and trust. Are you someone who enjoys phone work? Are you comfortable with both inbound and outbound calling? Are you ready to make between $15 to $20 an hour? 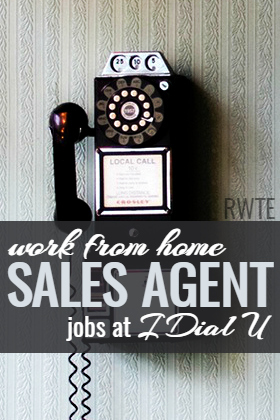 Then working as a remote agent at I Dial U might be something for you to investigate. What Exactly is I Dial U? I Dial U is a company which hires work-at-home agents to serve in a variety of industries such as automotive, mortgage, insurance, credit counseling, and collections. Agents respond to consumer inquiries, and there is no cold calling — instead you are supposedly contacting “warm” leads. There are both inbound and outbound agents needed on occasion. Also, the home agent model that I Dial U uses is inherently “green.” For instance, 100 home agents save an average of 26,600 gallons of gas per year and 600,000 miles of commuting. I Dial U sees this as a smart move to help preserve the environment. What Types of Jobs Are Available at I Dial U? What Are the Requirements to Work For I Dial U? to be assertive enough to present the sales offer, but also consultative and helpful. to be results oriented with a competitive attitude. to be able to manage a large database of consumer leads while helping people. to have a quiet home office with high-speed Internet. to have an updated PC. to have a high quality headset. to possess a pleasant phone voice backed with excellent communication skills. to be able to type detailed notes of each conversation. to be able to learn basic industry terminology of the industries served. Are You an Independent Contractor or an Employee at I Dial U? At I Dial U you are an independent contractor and responsible for your own taxes. Make sure you receive a 1099 for your earnings. Does I Dial U Hire Workers From Other Countries? Yes, again I Dial U does hire agents from other countries; however, most agents do come from the United States. Make sure you check with them first as to whether your country is one of the countries listed. What Are the Hours at I Dial U? The hours are flexible, and they are open 7 days per week from 7:00 a.m. to 10:00 p.m. EST for Monday through Friday. They close earlier on Saturday and Sunday. What is the Pay Like and When Is Payday at I Dial U? The pay may vary depending on the project you're on since it is project-based work, but they have recently had a project paying $8 an hour plus commission. The company claims that it has agents making $20 to $25 an hour. I have agents tell me that they are averaging $400 for a 25-hour work week. However, with performance-based pay, there are going to be some making a lot less. Payday is the 1st and 15th of every month via direct deposit. What is My Overall Impression of I Dial U? There seem to be several happy agents working there at least they are saying that on different forums. However, every time I Googled Glassdoor reviews, all I found were negative reviews averaging 1 out of 5 stars like this one. How Can an Interested Applicant Apply to I Dial U? Call the recruiting hotline at 1-855-424-4428. The whole recruiting process takes about 7 minutes. Once on the line, you will answer two questions. Once you have applied, you should receive an email within 24 to 48 hours via email as to whether or not you have been accepted. There is no need at this time to send a resume as they have been flooded with resumes in the past. I am scheduled to begin training with this company Monday, October 23rd. I am concerned about it being a scam, too. As it is, I am currently unemployed in a crappy job market and this is the only company that has offered me a job (unfortunately, I seem to get jobs with companies hire desperate people like me). I will comment more when I begin training. Dey changed the Payplan to make it impossible to make the base pay of 8 Hr Instead of having to make 2 sales to get the base pay you now need to make 6 sales to make the base pay including one sale which is through an affiliate Rental history Pros where the agent has to actually get the credit card number and SS# from the person you just cold called, that is impossible, would you give info out like that to some stranger who just cold called you? My last check was for $35 for 1 weeks work because I did not find anyone willing to give up their cc# or SS# that week, I make several other sales, but not this one. The two weeks before that I made base pay because I was able to pull the credit card number and SS# out of 1 person per week after much trying! Pass on Idialu ! I didn’t feel that the 2-interview questions offered enough time to elaborate on strong points due to the timeframe to answer them. However, I prefer one on one interviews with a person. I like to elaborate on topics for at least 2-3 minutes, However, the phone interview didn’t really allow enough time to give more details of previous work history, or elaborate on duties held. However, if you would like a resume, I will be happy to forward it. Thank you again for the opportunity. I DIAL U never paid my work. I tried to complete what they say is 25 hrs and 30 hrs on the second week. I even gave them sign ups. They are heartless. Today is my interview with them.. Before I go and apply for job online i always do a background check on them. Should I need to continue with the interview? I wanted to know what really happen on your case.. I have heard a lot of bad and negative reviews for IDU but there were also some who says they get paid..
Hi! did you get paid? I worked for I Dial U and the Call Center Operations VP Sharon Hegseth never paid me fornthe worked I did. She said she would trace my funds to find out why I was not paid, but instead disabled my agent account and never responded or paid me for my work. Also I Dial U is a Bait and switch company that preys on low income and low credit score people to trick them into getting credit help . The customers think you are calling the, about a loan but you are not. If you like to prey on down on luck people and not be paid for services this company is for you. Will you email me back? @Christina – Give it a try and see. It always amazes me how one person will have a super positive experience at a company and another person will have a super negative experience at the same company. There are so many places out there. Take your time and give the job a chance to see if it might be a fit for you. I too am sorry to hear about this. Some places just don’t work out. Like Anna said, and I will back it up 100%. Never get too secure. Have more than one egg in your basket. I also agree the training was rushed and hard to do when not familiar with the scripts at all.The actual job expectations were not laid out very well.But attendance expectations were well laid out. I did receive feedback on time on my job performance.I had a great experience with the company and got paid by them. Until I logged in for my work shift scheduled today to find my account disabled and no response from anyone as to why.I just started with them on May 27 2015. I understand we are independent contractors therefore they or us can end the contract at anytime. I suppose I would expect some kind of explanation of why. Employees are only as good as the training the receive and the opportunity to for further growth and learning. I feel that I was meeting my requirements sending my schedule working schedule.So hopefully they will fix the communication with their contractors and the job would great. I had a good experience and did get paid. You just cant depend on having a job for the long term or no when they are going to drop you. I’m so sorry this happened! It’s a good warning to others though not to feel too secure in it. @T. – Thanks for sharing. It does sometimes take some digging to find WAH jobs that you believe are a good fit. I actually worked with iDialU for a very short time earlier this year. While everyone I worked with and the management seemed very nice there were some things that concerned me. Firstly the training was supposed to be be over the course of 6 hours I believe, but it was actually only about two and a half. Then were expected to make calls for three hours. The problem with that was that the training really didn’t prepare us to do so, in my opinion. This job uses scripts, and we very quickly went over a few, but there were more that we did not train on, and those came up during our first calls! I was expected to make calls using scripts I had never seen before. There was help via skype, but everyone needed help at the same time for the same reason. Also the group I was with was brought on for training late in the week, on a Thursday. We were told we didn’t have to work weekends, but then were required to work at least 15 hours that first week, which was impossible without working on the weekend because we were not allowed to work shifts longer than 6 hours as new hires. Many people complained that they could NOT do that, which is why they wanted a job with weekends off. Also the majority of the people that I spoke with either did not fully understand the program (because we didn’t really answer your questions) or they did understand it and were angry, calling us scammers. To be fair I do not fault iDialU for the practices of its clients, but… The thing I liked the least is that you only got paid a bonus if the sales person you transferred the prospect to closed the sale. Your work really didn’t determine what you earned. I have seen lead generation programs before where the lead generator is paid bonuses based on the leads they provide, perhaps I am just unfamiliar with this business model. Again, this was my experience and it might be a better fit for others than it was for me. I had no issue with the people and they did seem to be a legitimate company.